I had a Duke’s of Hazzard lunch box when I was a kid. Even though my lunch box was cool, I was always jealous of my friends Pigs in Space lunch box. I would frequently get an apple and a peanut butter & jelly sandwich for lunch. Somehow the sandwich would always end up under the apple and by lunch time it would only be a millimeter thick. Lol. Squished Much? 😡 First comment. Squished? ._o You confuse me, dog-beast… Lava is not squished. I had that same problem, but it was PB + Honey, and a snack pack pudding cup. Mmmm Snack Packs. Biff needs a better Thermos. A Thermos that cannot hold molten lava is not a very good one. I like my Thermos, which can store black holes and antimatter. a Dukes Of Hazzard lunchbox? awesome. My Thermos sucked. the glass broke on Day 9. needless to say, my soup was ruined. You can eat glass filled soup if Biff can eat razorblade apples. I love the color of the lava and how it spirals out of the thermos instead of just falling. Plus, the thermos can’t have been all that bad if it kept the lava all molten. I want a new Dukes of Hazzard lunch box…preferably showing Johnny Knoxville weilding a phonebook. I keep my lava samples in the extra big Wal-Mart bags. Those things are thick enough to do the job. What happened to his soup? Is he standing on the lava? Does everything of Biff’s have to be green like his shoes, his lunchbocks and thermos, his green invisible car, his huge sofa? Why is everyone hooked on Dukes of Hazzard? Pigs in Space rocks, because they’re Muppets named after pork products. It’s interesting that he can stand in a lava field, as well as contain molten lava in his thermos without his fingernails melting again. Furthermore, how did he get it INTO the thermos? Dip it into the molten lava? And on another note, that’s a reeeeally tiny lunchbox. It’d hold probably one of your single-millimeter sandwiches and nothing else. Great comic, one of my new favorites. He’s biff, he can just conveniently regenerate. Oooh Biff you’ve done it again! I never use my thermos, because it smells like the old folks home. Shame. With all the lava that he has collected then he doesn’t need a thermos worth it, he can merely make a volcano appear in his house and give him all he needs. 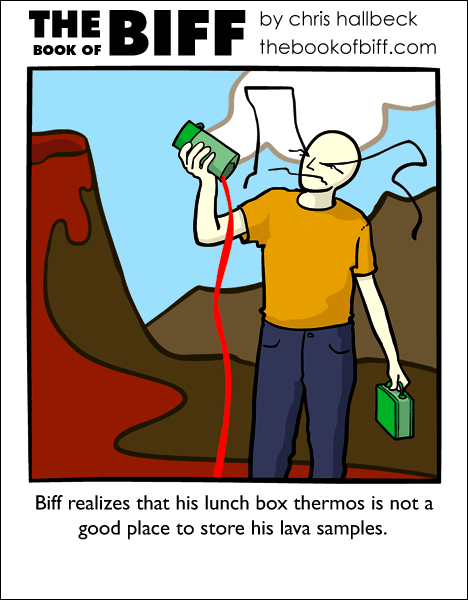 The lava samples being poured from Biff’s thermos aren’t the same color as the lava he is standing on. That suggests the lava samples have spoiled and the thermos is indeed faulty. Once again, Biff made the correct choice. This reminds me of the time I accidentally blew my thermos up in the microwave. The thing smelled like ramen noodles for a month. I’m guessing that Biff’s lunchbox has one of those spacetime compression field thingies that allows it to store more space than it takes up. Or maybe Biff just doesn’t eat big meals. Thermos : Keeps Hot things Hot and Cold things Hot. Well I managed to catch this one before it hit 24 comments. Dragonbrad, to make caffeinated oatmeal, substitute coffee for the water, then prepare as normal. I just put the bowl right in the coffee machine and let the coffee drip into the oats. you really like the whole lava concept don’t you? Ah but the upside is, when you do have a sandwich like that, it becomes a deadly weapon. I AM THE DEADLY SANDWICH THROWER!!! BOW DOWN TO MY AWSOMENESS!!!! zOMG * points* *runs screaming* A yank using metric!!!! I use metric, but it’s in the book I’m writing. My thermos conatins a naked singularity on the inside, so i can store as much as i want and still get it back. My thermos contains a naked singularity on the inside, so i can store as much as i want and still get it back. I don’t use a thermos, I bring a coffee/choko machine and a car battery with me – for maximum freshness! Doesn’t Biff’s have enough lava already?